"Careful now -- that's hot"? Let me ask you something. What's the first thing a kid does when you tell them not to touch something? Also, I don't know what my server means by hot. Frankly, most people are wimps. So I touch it, just to find out how hot. Typically not very. I like hot. Hot soups, hot drinks. Really hot. Most lattes are lukewarm by my standards. When I'm ordering from a Barista, I say, "make it dangerously hot. Put me at risk." Gets my point across. 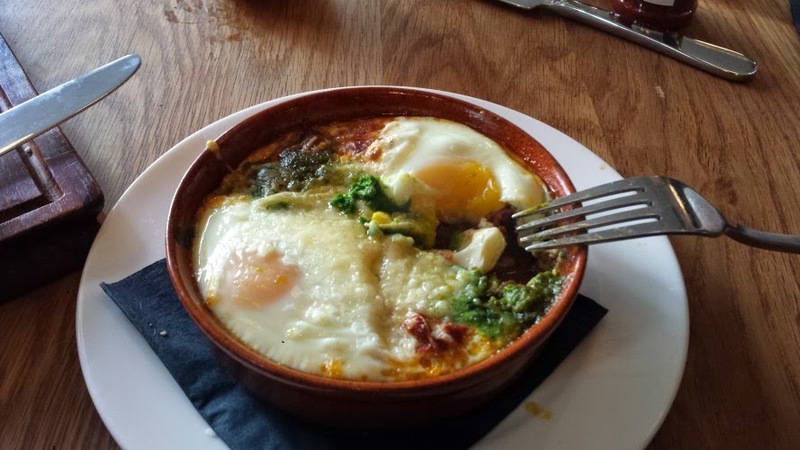 So imagine my delight when, last week, a steaming, baked pesto-tomato-egg dish was put in front of me with no warning at all. I grinned like a fool. I told the servers how delighted I was and thanked them profusely for treating me like an adult. I might have scared them a bit with my enthusiasm. Oh, and the food was fabulous, too.